It is one of these week when I look at what needed to be done and how much of it I ended up finishing until now, I go into a mid-week crisis! Good news is that my back is not killing me any more but I definitely have to be more efficient, stress less, sleep more. I have been testing two Origins products lately and today I would like to share my thoughts with you. I am new to Origins skin care but I have noticed they have many lines with different focus on each. One of the products I tested over a month now is from a collaboration with Dr. Andrew Weil, it is a night mask from their Mega-Bright line and it is supposed to correct pigmentation and dark spots. The second product is one of their new serums which Origins released recently to be applied under the moisturiser, called Original Skin Renewal Serum. 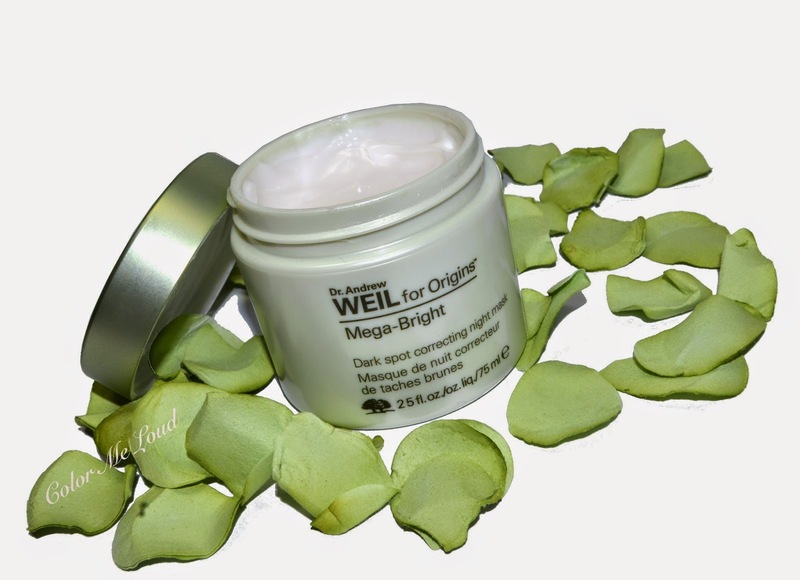 When I opened Dr. Andrew Weil for Origins Mega-Bright Dark Spot Collecting Night Mask, the first thing I noticed is its wonderful smell. It has a bit of apricots in these, smells very light and refreshing. I am thinking/hoping it is not a perfume which smells so good but it is the ingredients. It is recommended to apply this to the skin while massaging with circular motions. It is also written that one should gently massage in any access product after 10 min. I apply a generous amount all over the face and additional products to the spots where there is more discolouration. It is an invisible mask, so don't worry, you won't be scaring the post man. Anyway what does the postman do at your door at night time right? After the application, my face looks a little wet but not overly so, the product can't really be seen. So far so good, but I can't understand the second part of the recommendation, with access product after 10 min because after so much time, my skin absorbs all and I am left with a nice creamy complexion but no access products. That is not so bad though since I can apply it and directly go to bed. Nice thing about this is that it is very light weight, not greasy and next day it feels nice and smooth. I didn't find it extra hydrating though. Having dry skin, I have to apply an additional hydrating product to go with this for the night so that I wake up with a properly hydrated skin. It doesn't claim to be a hydrating mask so this doesn't speak against their claims. Origins Mega-Bright Dark Spot Collecting Night Mask comes in a 75 ml pot and costs around 65€. The catching phrase of Origins about their new Skin Renewal Serum is "Skin having a quarter life crisis?". And I sit here multiply my age with four and look at the number. Do you think I will live until 140? Originally this product is designed for those of you who are lucky enough to be still at their twenties. 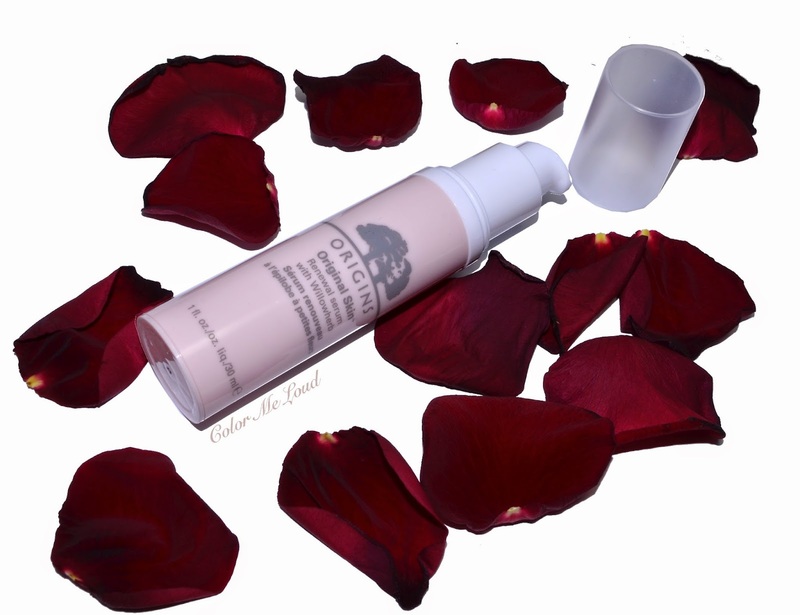 It is a very light weight serum to apply before your moisturizer mornings and evenings. It doesn't feel silicony and it feels more like a pore minimizing base. Since I don't have pores not do I need an oil control, it is hard for me to report how much these claims hold. 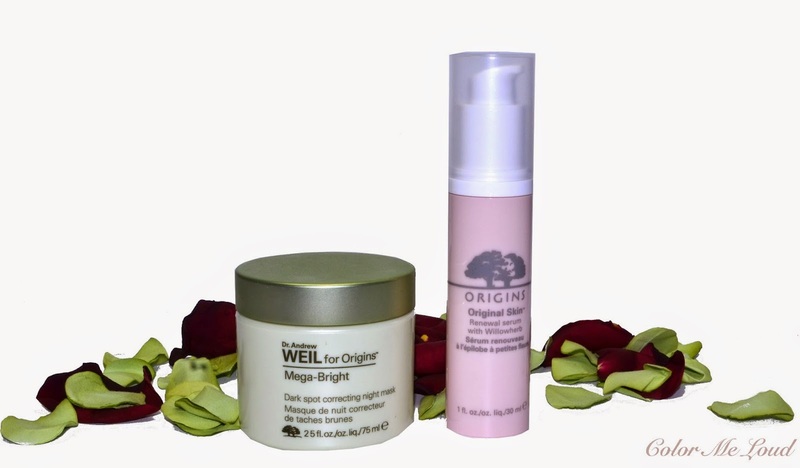 Origins Original Skin Renewal Serum with Willowherb has a light rose color and a lovely soft scent one which is wonderfully fresh and not overwhelming. I apply two pumps of this on my face and neck. It is recommended to wait for 30 seconds but my skin absorbs it almost immediately. I can apply my foundation directly after that or I apply a moisturiser in between the steps, depending on which foundation I reach for. I see a light blurring effect on the skin which is nice but if you are over 30, you might need something stronger than that, such like a glass of wine while thinking how the years went by. For youmger ladies out there with combination skin, you may want to check this out! Original Skin Renewal Serum with Willowherb comes in a plastic bottle with pump, has 30 ml of product and costs around 39€. Have you tried any Origins skin care? Would you recommend me any of them? I am a big Origins skincare fan. I wanted to try this line but I am a bit older than the targeted age:( I love their Ginzing eye cream which is a salmon coloured eye cream, perfect for morning to de puff. I also use their Plantation Serum and United balancing toner. Most favorite is their Night-amins night cream. Is your skin dry as well? I am dry, so need lots of hydration, would you still recommend Night-amins or Plantation Serum? Did you mean Planscription serum? I was trying to buy origins toner - mega mushroom skin relief lotion, but is always sold-out. It seems to calm down irritated skin, so I wanted it for a winter time. Origins charcoal mask is my favorite cleansing mask, mild but cleans deep. The rest is nothing really special, as Paula Begoun would say - for that money it should be more state-of-the-art )) the brightening products are often somewhat drying as they all contain some sort of acids because acids are some of the very few ingredients effective against pigmentation (except toxic hydroquinone, which I also used 5 years ago and still my under eye area is much whiter than the rest of my face, not recommend). Look for arbutin, licorice, kojic acid, lactic or glycolic acid, azelaic acid (most effective for me) and vitamin C (least effective for me even in highest concentrations) in ingredients. Usually there will be a combination of them. Retinol in its different forms also fights dark spots, low concentration doesn't usually cause a noticeable skin peeling. As your skin is dry, I would just do some good acid peeling 1-2 times and then use a stronger sunscreen and your regular skin care. Or, alternatively, use some good product for few months, every night. I tried lots of brightening products over last 10 years. Products which are not drying/irritating: TNS Lytera treatment, it is a serum for the night, to be used under the cream. It has several effective ingredients that help against dark spots (and anti-age), but without drying acids. I also love Pevonia Botanica Lightening gel, even more effective for me. It contains glycolic acid, but the pH is so high that it doesn't exfoliate or dry skin. I also use in the morning the Dr. Dennis Gross brightening serum with ferulic and retinol or Is Clinical super advanced serum with vitamin C. These two are weaker as dark spot removers, but have strong antiaging antioxidants and are thinner, so I use them during the day. All brightening products increase sun sensitivity of the skin, so I would not take them for a beach vacation and would wear a hat. Sara, forget all this, I know what you would like! :) I am also using cefine Night white gelee, it is Japanese brand. I have 3 of their night gelees, but this White one is against pigmentation. It is very very gentle, very nice to use, not greasy, light gelee texture that can be used before your regular night cream. You wont become white, no worries:) The jar will last you many months. I bought mine on ebay. Cefine btw also has a very mild retinol product, good for everything so to say, called Skin Treatment EX. It is a bit pricey, but also lasts a long time and is one of my favorite products. If you alternate those every night, you would basically do all you can against dark spots, without being too harsh on your dry skin. I would recommend both to use if you need a lot of hydration, I use the serum together with my daytime moisturizer. Use the night-a-mins with Kiehls midnight recovery at nite. My skin is pretty dry and I love the Nightamins cream. is this mask is helpful for dark circles??? thanks so so much. I will be visiting Japan soon so I will stock some skin care, I am putting Cefine on top of my list. Do you recommend any other Japanese brands I need to try? It will be a huge haul there! Gosh I didn't even have time to save lol. Dr. Andrew Weil for Origins Mega-Bright Dark Circle Minimizer. I haven't tried that one out yet. how long do you use the products. They usually work in months because discoloration needs time to get rid of. This one made my spot lighter and I am hoping in the months to come, it will be even lighter, fingers crossed. Mean while I am starting trying Clinique Spot Corrector Serum too, I will let you know about the results. Sofina Beaute Moisturizing essense/toner in a light blue bottle, Astalift jelly. I have Addiction mono eyeshadows and THREE Flash Performance Eyeliner and Shadow Lining Performance pencils, ESPRIQUE Liquid Eyebrow pens, Chicca Entizing lipstick are at the top on my wishlist. Maybe a traditional "geisha" lipstick Beni (just for fun). I love Shue Uemura eyebrow hard pencil and would buy several of them as a backup (they are dry on hand, but give color on eyebrows and last longer on me than TF), Jill Stuart blush (just because it look so sweet:), Moltobene Loretta body lotions (the most gorgeous packaging), would check Paul&Joe summer collection. Shu Uemura and SCOS Hair care. You are so amazing, my list gets longer and longer and my wallet weeps! I will report back, also Instagram. When do you plan to go? Oh that sounds so bad with customs :-( German customs is very slow and they check each package and it takes forever for the items to arrive but luckily nothing got lost until now. Couldn't you demand you money back? Where do they sell Radical skincare? If you are thinking nothing works, try to lay your hands on a generous size La Mer Illuminating Eye Gel sample, which they recently released. That one does work on me. In such situations I start to think crazy thoughts that paying $100 for an additional suitcase may be worth it:) especially, considering the price differences in online shops and shipping cost from asian websites. Maybe you can also arrange some tax-free on your way back. I would go nuts over brushes and suqqu eyeshadows and cle-de-peau lipsticks:) I cancelled this year as I need to do few family trips, but next year I will definitely go. I think in stereotypes that I should visit Japan only in spring :) I read that some brands are only being sold in certain department stores, hopefully you will find everything on one street. People also recommend checking their shoes, they often have unusual design by our European standards. I would not buy clothes though. I once shopped in China and while I am standard xs, I realized later at home that all sleeves are too short, looked funny :) I saw your by terry review, feel bad, hope you can sell it on ebay for at least half the price. That was not the only time. Also a Swiss brand has sent me a package with samples THREE TIMES!! and I never got any. In the end they stopped sending me (so I lost in the game) but I strongly supected someone in the local post office kept steeling the stuff because that was just too much of a coincidence. I have so many open claims that everybody knows me there, hahaha. my feet are 40 so no luck with those beautiful shoes. Last time when I was in Japan, I just watched them and sighed. They are really beautiful but the biggest one was 38 or something hahaha. Please don't feel bad about By Terry Palette. I buy stuff all the time and some of them turn out to be not working. I am so used to it. Also it may work on one person and not work on another. I will reply your other comment but I know what you mean by shimmery etc. Sarah, for brightening, I've been having great success with Peter Thomas Roth Glycolic Acid 10% Hydrating Gel. I apply at night, and results are almost instant, my skin is noticeably brighter and smoother the next morning. It does have a somewhat sticky feel and it isn't hydrating enough on its own for my +40 skin, but I let it sink in, then apply another moisturizer on top, and it works its magic. This used to be sold out all the time, but fortunately, they've expanded the stock and it's easier to buy.